Complete the license application in the Used Car Dealer Application online. Purchase a surety bond worth $35,000, available through your insurance agent. Purchase insurance for your business; liability-only is not acceptable. Obtain a place of business, making sure that the location meets all zoning requirements. Take photos of your place of business that feature the sign and building prominently in the picture. Establish a permanent phone at your place of business, making it easily verifiable; unlisted numbers are not acceptable. Attend a pre-licensing seminar (approved providers are listed in the Used Car Dealer Application online). Acquire your Sales Tax ID Number from the Department of Revenue. 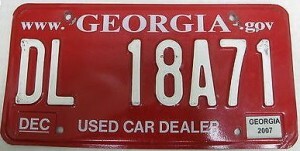 Pay the $170 application fee, made payable to the Used Motor Vehicle Dealer Board.